Old footage of Reggie Fils-Aimé at E3 has surfaced online. Apparently, it's a formal introduction to media managers at a manager media brief about all the content Nintendo intended to showcase at the annual event in 2006. The YouTube channel responsible for the upload said it would share more classic footage soon, so stay tuned for flashbacks to simpler times when it was all about the Nintendo Wii and DS. My body was not ready for this. The world needs more Reggie. I can’t stand that guy at all. 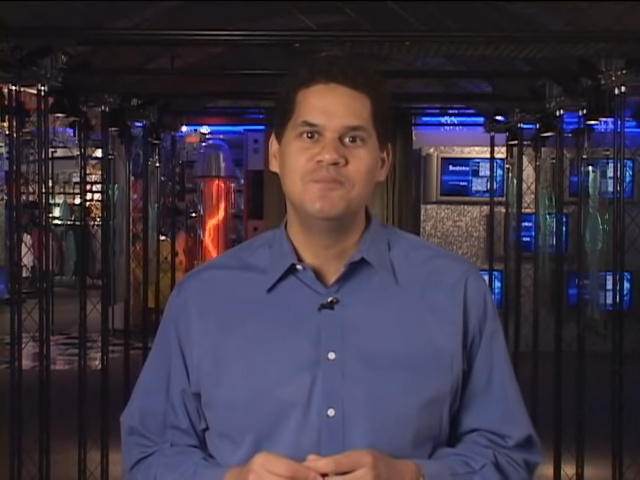 I'd like to see a world where Reggie could be more active with videos and social media. His public persona is very entertaining. Wow, Reggie has gotten significantly better at public speaking over the years. I am convinced that Reggie and Sakurai are vampires. neither of them ever age! @CharlieSmile They sucked the life out of Iwata. 2006 is "Old-school" now? Man time goes by too quickly. For me Old-school is the Spectrum 128k, World Cup Mexico 86, 7-up yo-yo's, shellsuits, all night raves and glowsticks. How long until the Wii is 'retro'? Is the GameCube already there? @OorWullie my thoughts exactly!! Surely 13 years ago can’t be considered old school!! !.......and I remember Mexico 86 too, the little mascot ‘Pique’ on front of the Panini album! "Hello, This is Reggie!, thank you for attending E3 in 2006, just want to tell you Pikmin 4 is coming....just can't tell you when, but "it's in development and almost done!." Well , that’s all the time I have. I have to get back to playing Animal Crossing: New Leaf on my Nintendo 3DS. I can't wait to drop off the Battle Bus and meet some of you on the battlefield in Fortnite. And on the Nintendo Switch, you can have the compete Battle Royale experience, whether playing together online with friends in the same room or around the world. Avaliable at 10AM pacific time today. His body was not ready yet. His new name should be Ready Fils-Aime. Look, 20 years ought to do it for retro, sadly for us ageing humans. Bare in mind that in 2000 when Gamecube was born, the Atari 2600 was 21 years old.. It's a tragic tragic thing, this time situation. Try to get done what you want to get done the clock is always ticking. Nintendo didn't even know what a success they had with the Wii when this video was made. Seriously though, 20 years is hardly old....it just seems that way in interactive entertainment because of how fast it moved over the last 40....that pace has radically slowed though. 2019 to 2039 won't seem nearly as old as 1979 to 2000 did now that the tech is mature. GCN is unique though in that it ages well despite being forgotten. Nothing feels remotely 19 years old about it, while PS2 feels like a dinosaur. And 'most importantly' what is with that awful set design! @tourjeff What, did Nintendo Aemrica not deliver the Direct they promised? 2006 is old school? You young kids. What does he keep trying to catch?